The Delta Kite - Some Background. 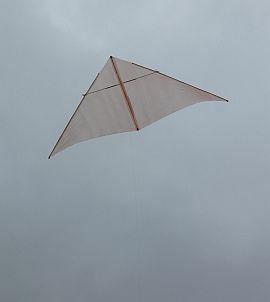 The modern single line Delta kite is designed to be an eye-catching spectacle as it floats about on its flying line at a high angle. Most Deltas are designed to fly well in light wind, so if you own one you should get plenty of opportunities to get out and fly. 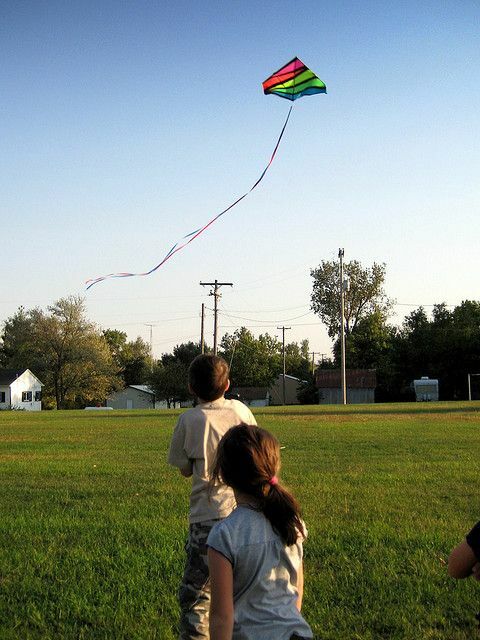 Even a cheap mass produced plastic or nylon Delta kite will perform well enough to impress most onlookers! The Delta is actually a very versatile design that can be altered slightly to suit all wind ranges. For example, a high-wind Delta kite will have its towing point more towards the nose of the kite. This reduces the pull on the flying line, and hence the stresses on the spars. Also, the amount of sail billow can be increased to provide more directional stability. Kite shops sing the praises of Deltas describing them as stable, easy to handle and wonderful fliers. If it wasn't true, do you think there would be so many around? By the way, the fourth letter of the Greek alphabet looks like a triangle, and is called Delta. Hence the name of the kite. Not all Delta kites are the same, so how do they vary? overall size of Deltas varies enormously! the basic outline can vary quite a bit too, with some extreme examples looking more like an overgrown bat than a triangle! graphic artists find an outlet doing the design work for shop-bought kite sails - and Deltas are no exception! Size. The first thing you might notice after walking into a kite shop, is that the smallest are about a meter (3 feet) across while the largest can be enormous in comparison. The biggest ones are best left to experienced fliers since the right line strength needs to be used for the conditions. In fresh wind, even a Delta can pull very strongly, if it's big enough. While this makes them a handful for beginners, it also means they are useful for showing off long tails and windsocks or flying fancy inflatable objects from the flying line. Have you ever seen these at a kite festival? According to kite shops, 2 meter (6 feet) wing span Deltas are the most popular. One of the biggest retail designs in 2008 was the Sweet 16 Delta, which has a span of 5 meters (16 feet)! Even that pales in comparison to another kite, a one-off, which was used in altitude record attempts in Canada in 2001. That was more like a small aircraft, being a massive 10 meters (30 feet) across. Interestingly, it had hollow fiberglass spars. Shape. The shape of a Delta kite floating high in the air sometimes causes people to describe it as a bat or bird kite. Or even a wing kite. This more likely if the Delta has a curved trailing edge and extra battens in the sail. In fact the exact shape of a Delta is open to much creativity. On a computer, the basic Delta shape can be stretched in the vertical or horizontal direction, clipped at the edges or have curved areas called scallops cut out of the trailing edge of the sail. However, as far as I know the leading edges are always straight. Construction. Although most Deltas in 2008 are shop bought, many are made from kits or even built from scratch like my little MBK Skewer Delta. The shop bought ones tend to have fiberglass or graphite rods for spars and plastic or nylon fittings in which to insert the cross spar or spreader. During manufacture, the leading edge spars and vertical spar are inserted into hems in the sail. Interestingly, the spars are not attached at the nose end. They float free in the sail material, which helps give the Delta its unique and fluid flying characteristics. Also, for best performance, the leading edge spars need to have just the right amount of flexibility. Most Deltas have a flexible keel attached to the underside of the vertical spar. 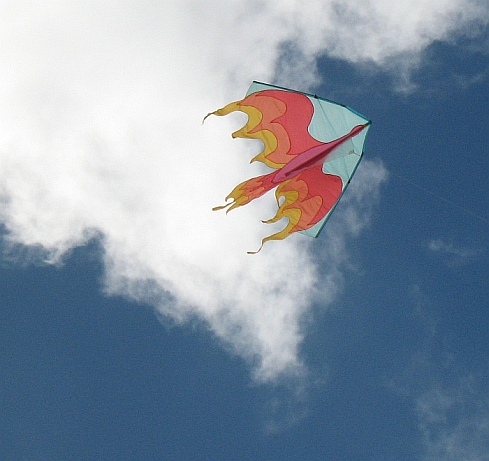 This aids stability and acts like a vane, helping to keep the kite pointed into wind. With the cross spar or spreader removed, a Delta can be rolled up into a narrow bundle for carrying around. Tails. Most Deltas you are likely to see have at least one tail, and often one short one near each wing tip as well. Smaller Deltas sometimes use a fringe of loose material all across the trailing edge. It's not just for looks! The fringe actually acts as a series of very short tails, helping stability. Some skilled kite makers turn their noses up at these tailed retail kites. That's because when a Delta is well designed and very accurately put together and balanced, it will fly quite happily with no tail at all! Decoration. Here are some modern methods... Strips of different colored material can be joined together before the outline is cut. On the other hand, the appliqué technique involves sticking light but colorful cut-out patterns onto the sail material. Also, printed sail material is used for mass-produced kites. For home-builts, hand painting or airbrushing can be applied after construction is complete. There's a bunch of different ways to decorate a sail. Bridle. As mentioned earlier, Deltas generally have keels. The keel doubles as the bridle, since the towing point is a hole at the tip of the keel. Hence, the bridle towing point cannot be altered easily. No problem, Deltas are designed for different wind strengths, with the keel and hence the towing point in a different position accordingly. 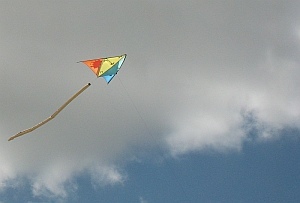 A light wind kite has the towing point moved back towards the tail, while strong wind kites have it moved forward towards the nose. Having said all that, some designs do have more than one towing point in the keel. This gives a bit more flexibility. The flying line can be knotted to the towing point that best suits the wind strength. Sail. Rip stop nylon is a popular choice for the sail material. Special spinnaker fabric is used for light wind delta kites. Isn't it interesting how a material made for pulling something as big and heavy as a boat ends up being used in some fairly delicate kites! It must be amazing hi-tech stuff. Extremely light and non-porous. A light wind Delta kite can actually be flown for extended time periods in thermal lift. Just like soaring birds or hang-gliders! The skillful single-line delta pilot can actually search around the sky for thermal lift, then let out line as the kite soars up in the warm rising air. In this way, long flights can be achieved when all other types of kites simply can't stay in the air at all due to a lack of wind. 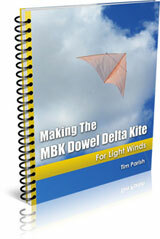 Unless you are a keen fishing person, you might not have heard of the Delta fishing kite. Often, simple diamond or sled designs are used for fishing, but some of the most useful ones are Deltas. That's because specially designed fishing deltas have extra large wind ranges and the best tacking ability of any other type of fishing kite. Now, you might know about good wind range, meaning the ability to fly in light or strong wind with the same kite, but tacking? That's when a fisherman attaches a tail or drogue to one side of the kite to make it hang left or right. This way, more than one fishing line can be dangled in the water at once. For example, you can fly one kite off to the left and one off to the right on similar length flying lines, from a small boat. Some systems allow tacking up to 60 degrees away from center. I wonder if they can get 3 or 4 up there on 50 meter lines, with no tangles. By 1957, this business had successfully patented the keeled kite, and was selling them under the Gayla brand name. These designs were lovingly hand made, and put together so well that they flew without tails - as the best Deltas do. 'The Nantucket Kiteman', Al Hartig then produced a new Delta kite design in 1963. He named it the Valkyrie, and it was inspired by the Gayla kite. This finally prompted a lot of interest in Deltas generally, so many people started making them. This seems a common theme in kiting histories - a single outstanding or innovative design kicks off the public acceptance of a whole class of kites! Another influential point in the history of the Delta kite was an article in the popular Kite Tales magazine, in Spring 1974. This article was by Bob Ingraham and gave a step by step method for constructing a high performance Delta. Kite makers still follow it today. In later decades, the production of this type of kite just exploded all around the world so there's not much point in trying to pick out any more major points of history. The information source for my very condensed history write-up is Mr Delta Kite himself, Dan Leigh, from the U.K. The video below shows a very tastefully decorated and tailed Delta we saw at the Adelaide International Kite Festival.